How to Select the Best Commercial & Industrial Log Splitter? Because we are spoilt for choice when it comes to log splitters, it can be hard to choose one that’s suitable for commercial and industrial use. Not just any splitting machine or splitting equipment will do what you want it to do. You need to review plenty of options, make comparisons between various makes, brands and models, and find one that’s perfect for the task at hand. 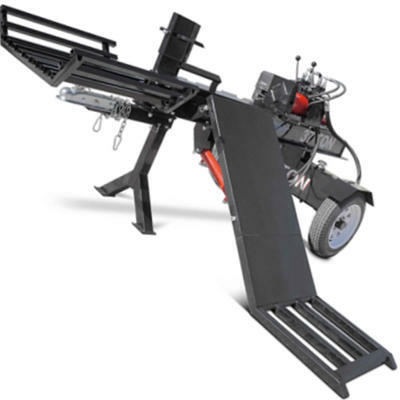 Within this buying guide we will show you several different options to ensure you get the best commercial log splitter for the money. When you’re looking to purchase the best commercial or industrial log splitter for the money, you no doubt have a lot of wood needing to be split. After all, the power produced by either an industrial wood splitter or a commercial grade log splitting tool is not the power needed for small residential splitting tasks. In fact, it’s important you are aware of the exact work you’re undertaking to ensure you get the best tool for the job, at the best price. When purchasing any kind of commercial or industrial equipment, you should have safety procedures in place for all staff and operators. Below is a helpful list of some of the things you can do to remain safe around your log splitter. Wear safety clothing such as steel-toe boots, a hard hat, safety glasses and gloves. Have two people with the machine during operation at all times. Don’t load the machine while it’s operating. Don’t leave it running when it’s unattended. Don’t put more than one log in it at a time. Don’t put in logs too big for the machine. Put logs in straight to avoid them flying off and potentially injuring someone. In order to make sure your log splitter runs as efficiently as possible, you must ensure you follow the manufacturer’s instructions. Split wood within the recommended size range. Use fluids, oils and lubricants that are recommended by the manufacturer. Opt for an engine size that will handle your logs. Commercial and industrial log splitting tools come in a range of sizes and shapes. This means features vary from one machine to the next. Some top rated machines use hydraulic components, whilst others rely on air power. Some will also come with easy-to-access parts for easy maintenance, as well as two handles for more control, and features for easier portability. It pays to be aware of the features you require, in order to find the log splitter that best suits your requirements. Because your splitting equipment will be used in a commercial or industrial setting, it’s more important than ever to make sure it’s maintained correctly. Failure to do so can result in serious injury to workers, and damage to the machine as well. Below are a few general maintenance tips to help you on your way to a healthier machine. Always keep lubricant and fluid levels topped up, and replace when necessary. Check the machine for debris before and after every use. Check all nuts and bolts to make sure they’re in good condition. Check all machine guards and safety components to ensure they’re free from cracks or imperfections. Ensure the hydraulic lines are in good working order, and replace any perished lines. Many manufacturers of particular models also include a free maintenance checklist within the operator manual. This can be helpful for staff to use before and after operating the log splitter. As commercial and industrial log splitters generally produce over 20 tons of force from a large motor, they come at a high cost. You’re paying for quality and it definitely means you pay a lot. 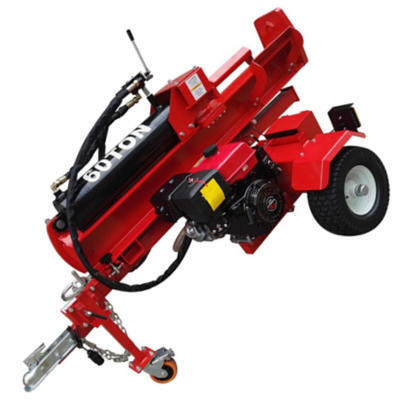 However, the best commercial log splitter for the money is one that has everything you require within your budget. Compare the features in comparison to the cost to ensure you’re getting the best deal possible. You can also read customer reviews on Amazon which can help you decide whether your money’s better spent elsewhere. It’s quite powerful in a commercial setting. The manufacturer is very easy to contact with any problems. It’s quite affordable in comparison to some other log splitters on the market. It has a recoil starting system to make it easier to start. It only comes with a 90 day commercial warranty. Its cycle time is quite slow in comparison to other log splitters for sale. Dimensions: 60 x 42.5 x 45.5 inches. Warranty: 90 day commercial warranty. 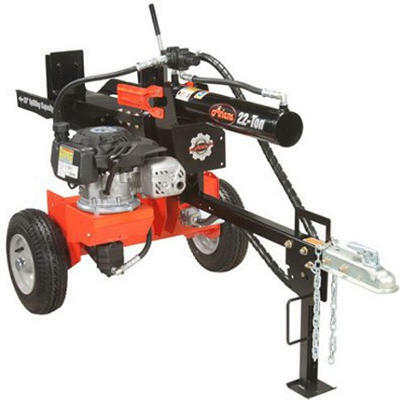 When you require reliability and durability, you can expect all that and more with the Ariens Company log splitter. It’s powerful with its 4.5HP motor, splits logs up to 25 inches with ease, and is relatively easy to maintain. However, in a commercial setting, time is money and a 13 second cycle time can slow proceedings quite substantially. It does represent good buying for its overall power and features though. Check out what other people who purchased this product think about it. Read Ariens Company 917011 commercial and industrial log splitter reviews. It has an idle-down feature which means you don’t have to turn it off when you’re putting in another log. The hydraulic pump adjusts the flow and pressure automatically. It offers 37 tons of force. It is relatively quiet in comparison to other log splitting equipment on the market. It comes with a 4 year limited warranty. It gets very hot with extended use. It’s quite unaffordable for many people. Dimensions: 90 x 43 x 42 inches. Splitting Wedge: 4-way retracting wedge. QDoes it have an automatic cylinder return? QDoes it come with hydraulic fluid? Although it’s not the most affordable option for the commercial market, it doesn’t have to be. It makes up for this downfall with pure power, log capacity and accuracy. You can expect this NorthStar splitter to split your logs with relative ease – all from a horizontal or vertical position. It can even achieve 37 tons of pushing power, all from the Honda commercial GX270 series engine with cast iron cylinder sleeve. Don’t settle for less than the best when there’s log splitters such as NorthStar on the market. Check out what other people who purchased this product think about it. 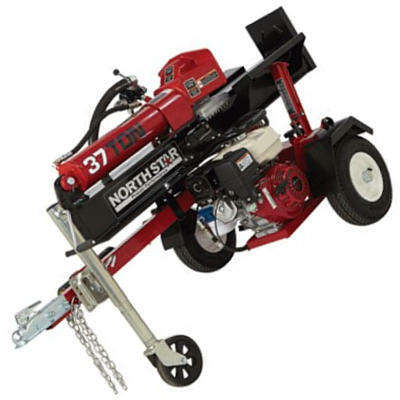 Read NorthStar commercial and industrial log splitter reviews. It’s exceptionally powerful as it delivers 50 tons of force to split wood. It can split logs 25 inches in length. It can be transported with relative ease. It’s designed to provide concise splitting for professionals. It has an electric start. It’s priced quite high on the market. It has a poor warranty of just one year. Dimensions: 91 x 51.5 x 70 inches. QHow fast can you tow it? QWhat brand is the motor? ALoncin, sold in most Home Depot stores. When you choose to buy a Samson Machinery log splitter, it can be easily considered a bit of a gamble. That’s not to say the product itself doesn’t work well or as intended, but it has a couple of problems. The first is the price. When consumers compare the features of this commercial grade log splitting tool to others, they will see the features are relatively similar. The only difference is the pushing power. Although the pushing power is a bonus, when the log capacity is much the same as others, it’s of no real significance. The other problem is the warranty. If you’re spending nearly $3,000 on a machine, you would expect a better warranty. One year can sometimes not be enough, especially if repair costs can be as much as the machine itself. For these two reasons, this machine is not the best commercial log splitter for the money. Check out what other people who purchased this product think about it. Read Samson Machinery LS60T-610MM commercial and industrial log splitter reviews. It offers two convenient starting options. It has a log-lift to lift heavy logs onto the platform itself. It has a fixed blade design to cut logs into four pieces with ease. It’s exceptionally powerful with its 420cc engine. All parts are durable and heavy duty. It can split longer logs than several other splitters on the market. It’s very well priced in comparison to its feature list. It’s very heavy, therefore it can be difficult to transport. The assembly instructions are poor. Dimensions: 86 x 28.5 x 24 inches. This Titan log splitter is essentially the crème de la crème of commercial and industrial log splitters. Not only does it provide you with the convenient option of splitting larger than standard logs, but it helps you do it! It will lift those heavy logs for you, and will then neatly arrange them in the log cradle. This Titan log splitter even has several safety features to ensure the operator remains safe at all times. It’s jam-packed full of features and the quality is exceptional. It’s easily one of the best commercial log splitters for the money. Check out what other people who purchased this product think about it. 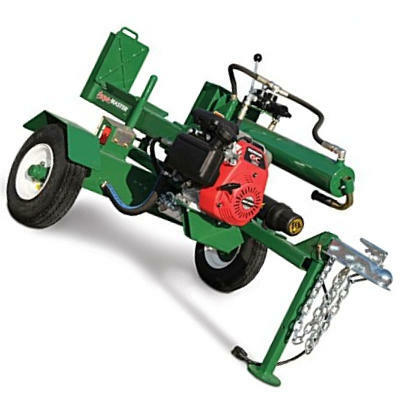 Read Titan Outdoors commercial and industrial log splitter reviews. It’s made with high grade steel. It has a generous 2 year warranty. It can be towed on a highway if you register it for a plate. It comes prefilled with hydraulic fluid when many don’t. In comparison to the cost, it doesn’t have very much splitting force. It has a slow cycle time. It’s very expensive, especially when its features don’t stack up against cheaper models. Dimensions: 87 x 49 x 42 inches. Warranty: 2 year commercial warranty. Even though this log splitter can be towed on the open road as long as you register the trailer, it’s still hard to comprehend why it’s so expensive. Its splitting force is less than many cheaper machines on the market, and its log capacity is also at least 6 inches less as well. It’s well made and is exceptionally powerful and durable, but it’s a little overpriced. Check out what other people who purchased this product think about it. Read Surge-Master 26HVGC-L commercial and industrial log splitter reviews. Where to Buy Commercial and Industrial Log Splitters? Industrial wood splitters and commercial grade log splitting tools are expensive machines to purchase. Sometimes it doesn’t even matter what manufacturer you buy it from, it still seems out of reach. So when you’re looking to save a little extra money, you should buy online. You can often get the best deal when you choose to purchase your splitting equipment online. It’s often here that you get the best customer service as well. Even though it’s just as convenient to head to a store, this is not always an easy option for everyone.